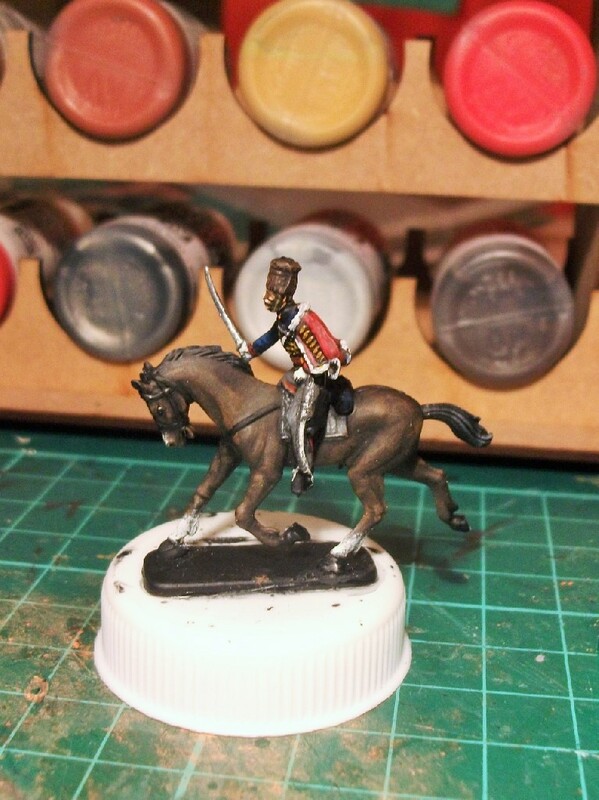 Whilst taking a little time out from painting my latest Nappy Cavalry Regiment, I revisited my Quiberon Expedition venture that I’d first begun after returning from holiday in July. 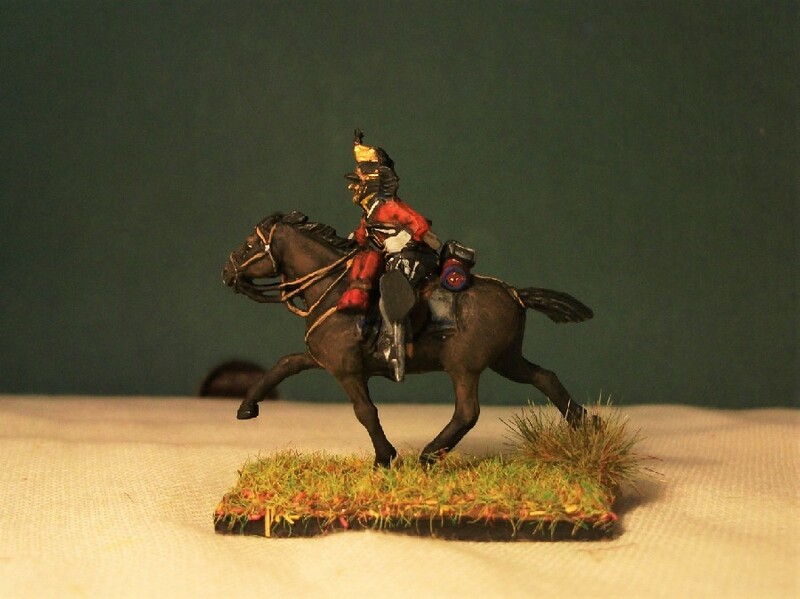 I’ve previously posted some progress pictures of the Royal Emigre Regiment and the Royal Marine Regiment, but I’ve also recently begun the Royal Louis Regiment too. 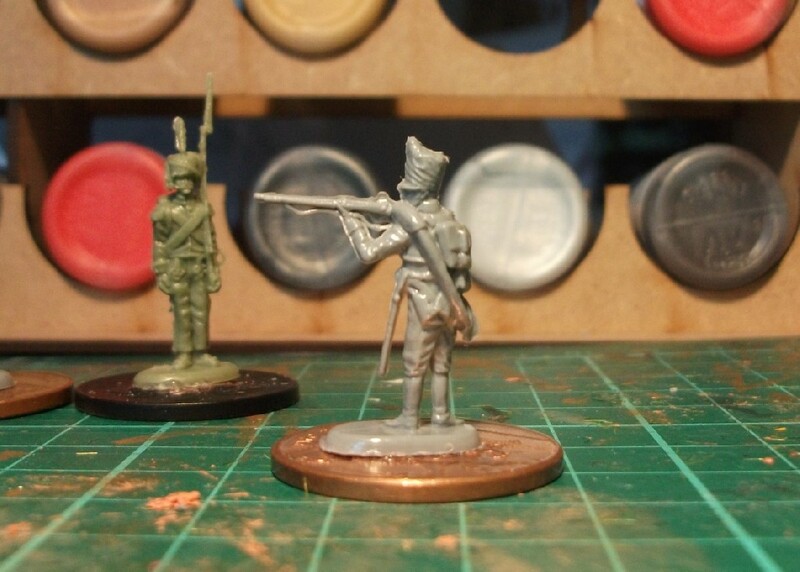 For the other regiments I’d been using Strelets’ British Infantry in Egypt set, but for the Royal Louis troops, I needed the Strelets’ French Infantry in Egypt set instead. 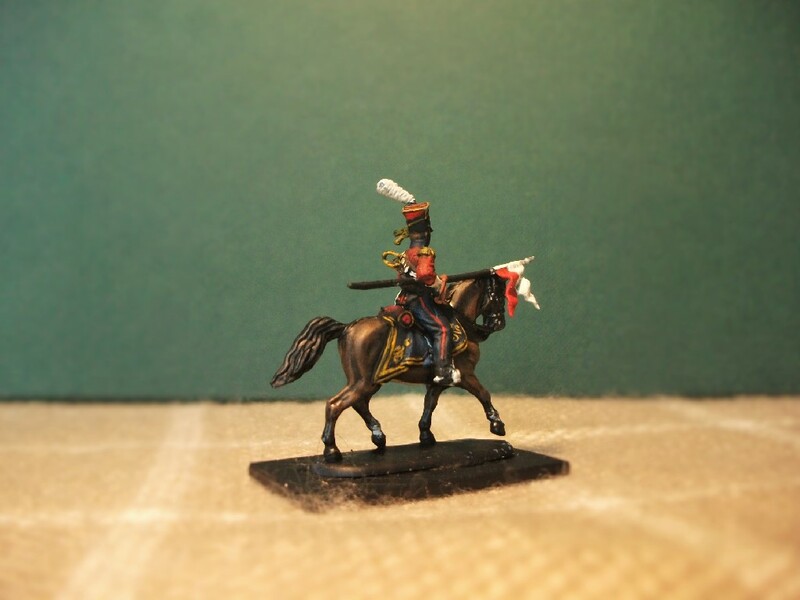 Neither of the Strelets sets are perfect for the Quiberon uniforms, but with the strategic application of paint, at 20mm tall I fancy I can almost get away with it. 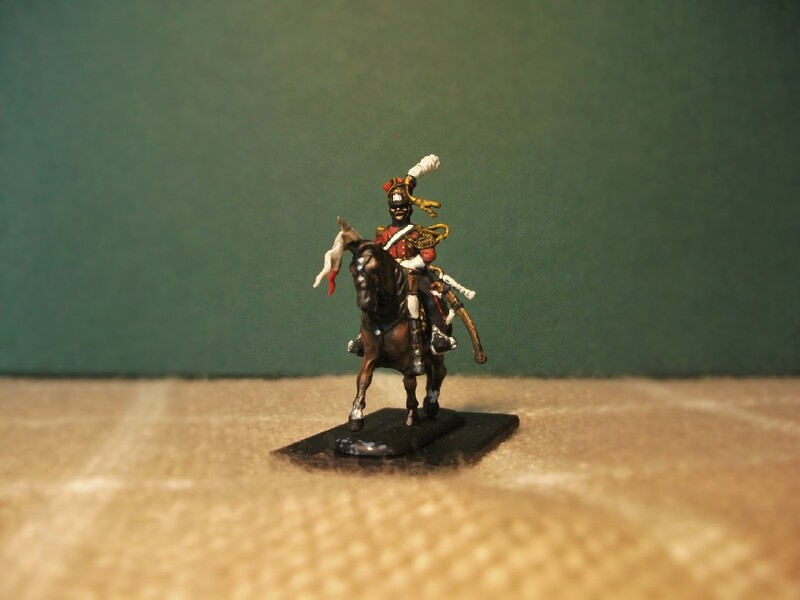 The Royal Louis Regiment features the pre-revolutionary white uniform, but I could use the same figures for their adversaries, the revolutionary French troops themselves. 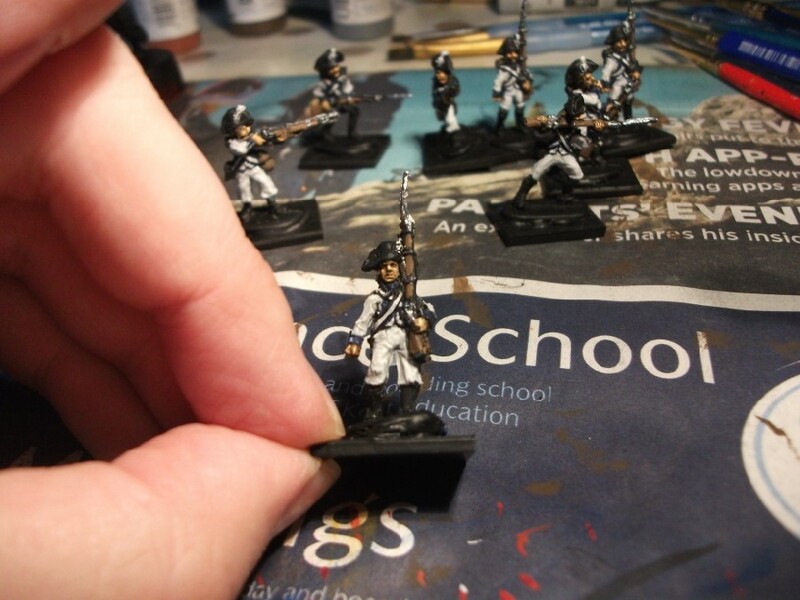 In progress… the Royal Louis Regiment. 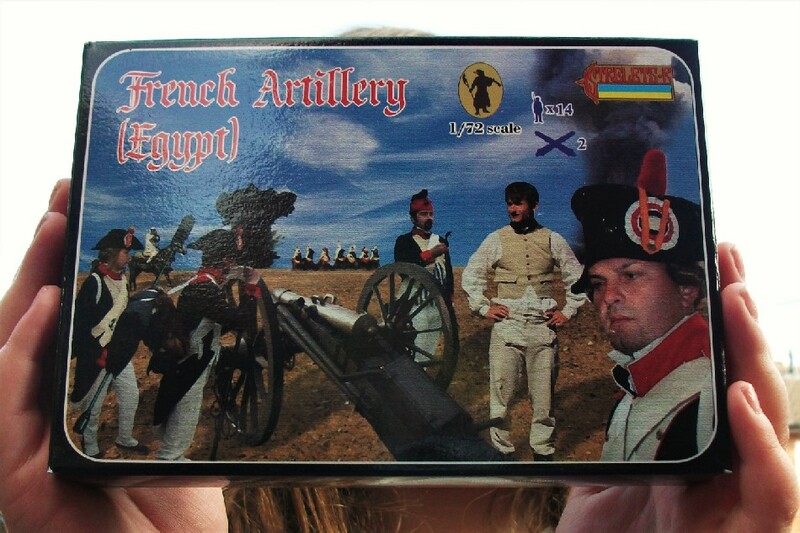 Strelets French Artillery in Egypt box (with assistance from my daughter). 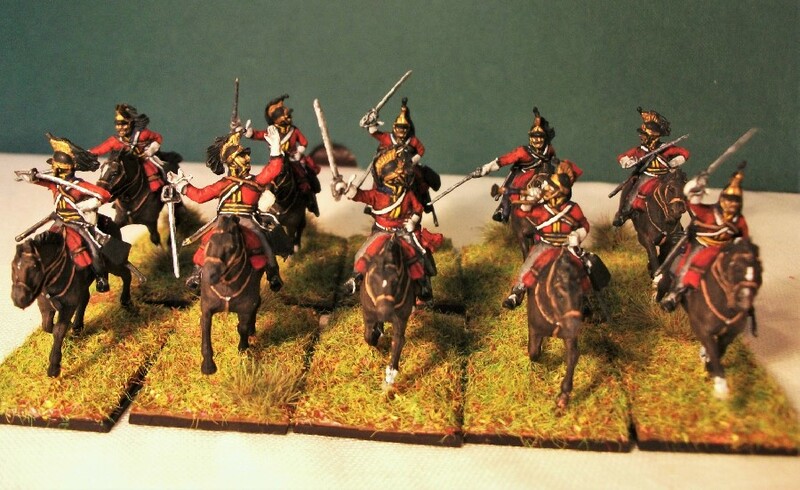 It has been a case of slow, careful progress with the latest Nappy cavalry regiment, the Dutch Red Lancers of the Imperial Guard. It has in no way been onerous (the set is wonderful) but the figures demand careful attention to produce even a vaguely decent result. 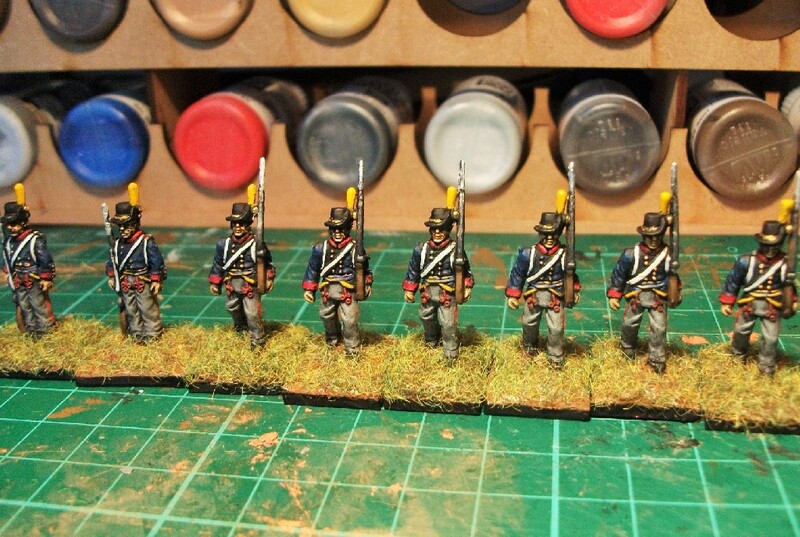 The first six are now nearly completed, with five more still to go. But now for my ‘whine’. 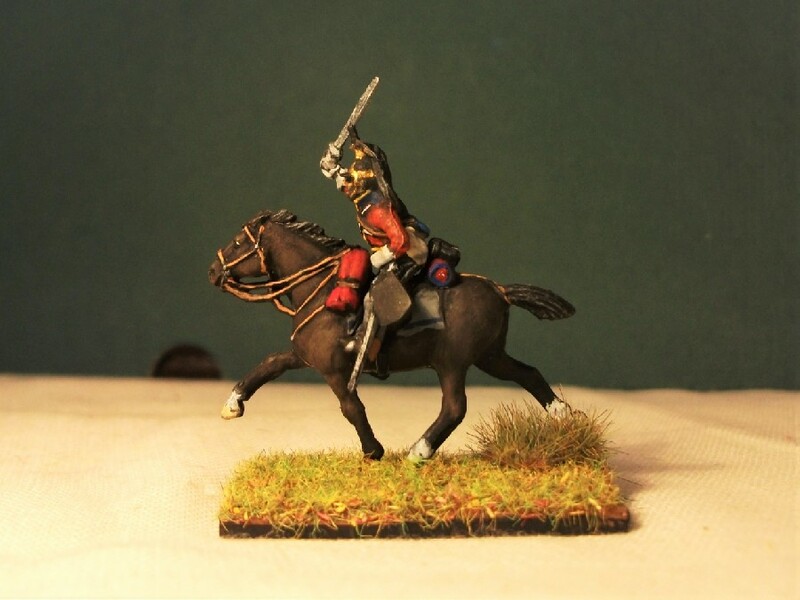 Mounting the figures on to the horses has been a cause for some frustration. 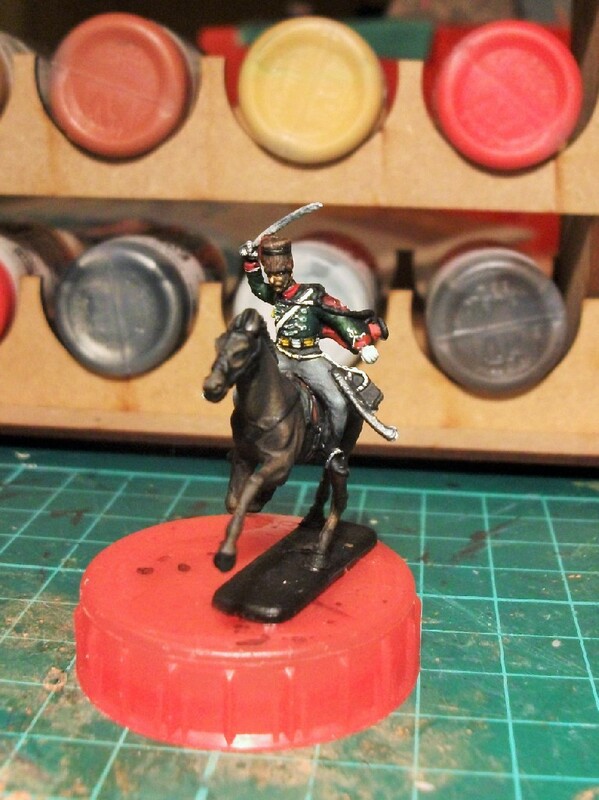 Zvezda have designed the set so that the riders have two pegs on their legs to fit into holes in the horses flanks. Unfortunately, getting the pegs into the holes is virtually impossible even with heavy handling. 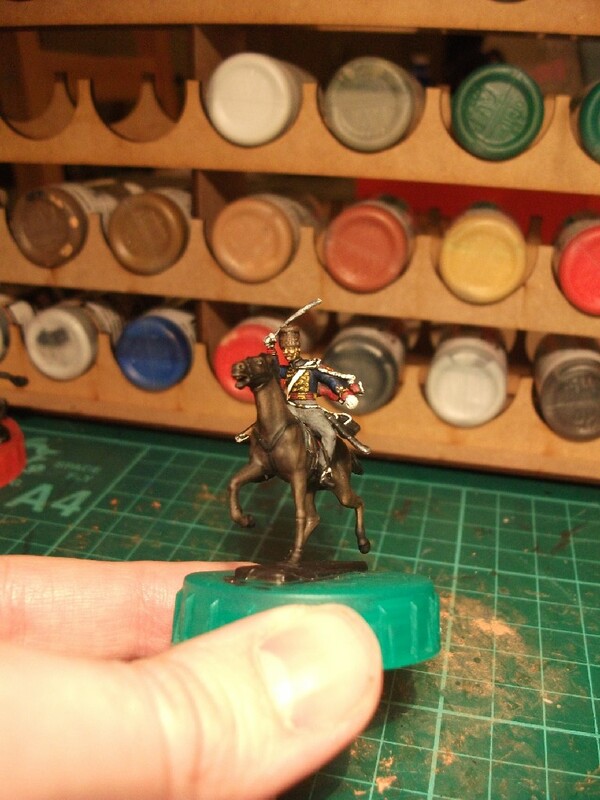 All this has caused a good deal of damage to all my careful paintwork on both horses and riders. Eventually, my solution was to simply cut off the pegs and rely on the glue, which worked more than adequately. 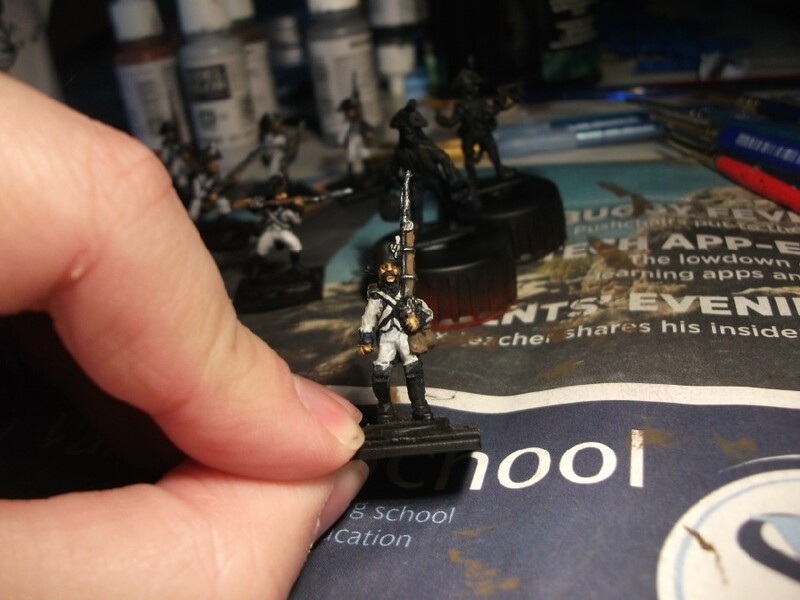 It may not be immediately apparent but the figures shown here all require a lot of touch-up work to hide the damage caused by the difficult mounting process. With five still remaining, maybe I’ll learn from this. 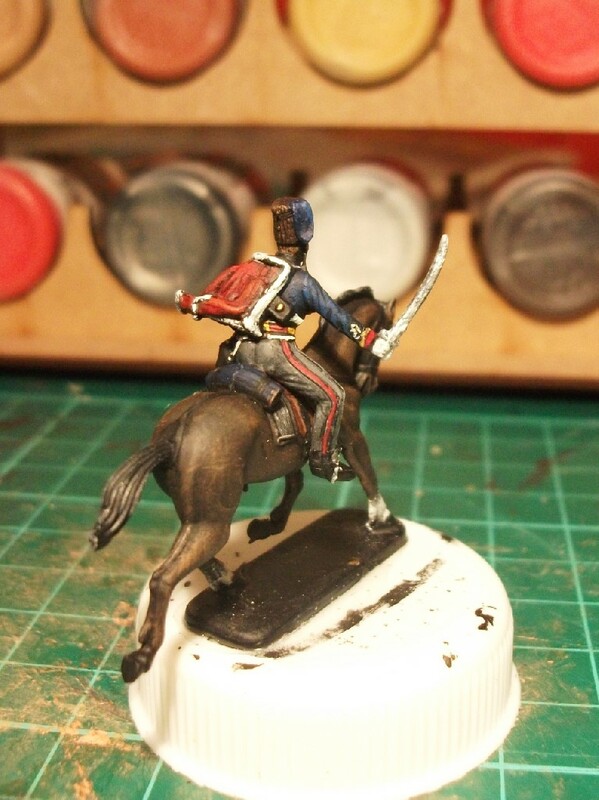 That said; I am pleased with the figures. 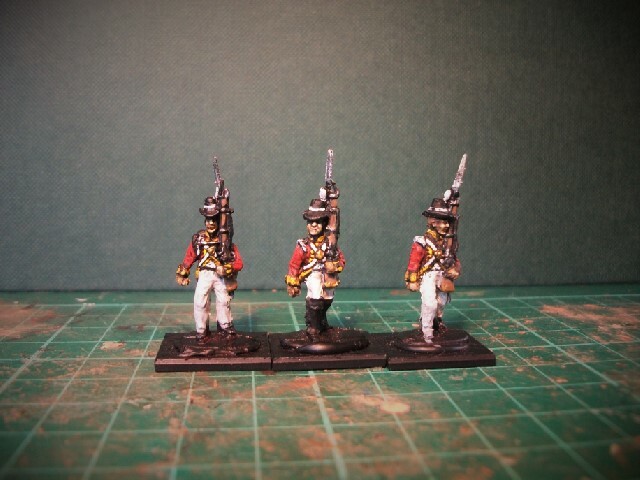 I’m never sure that I’ve quite done them justice but they’ll do. 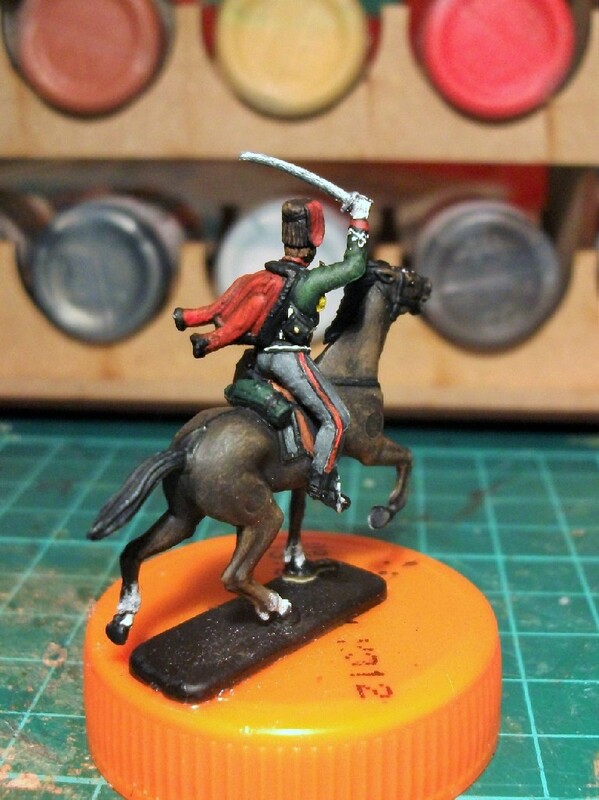 At current rate of progress may take a little while until the remaining five are finished, so it may be timely to post to the blog some ‘Featured Figures’ as a stop-gap soon. Until then, best wishes to all Suburban Militarism visitors. 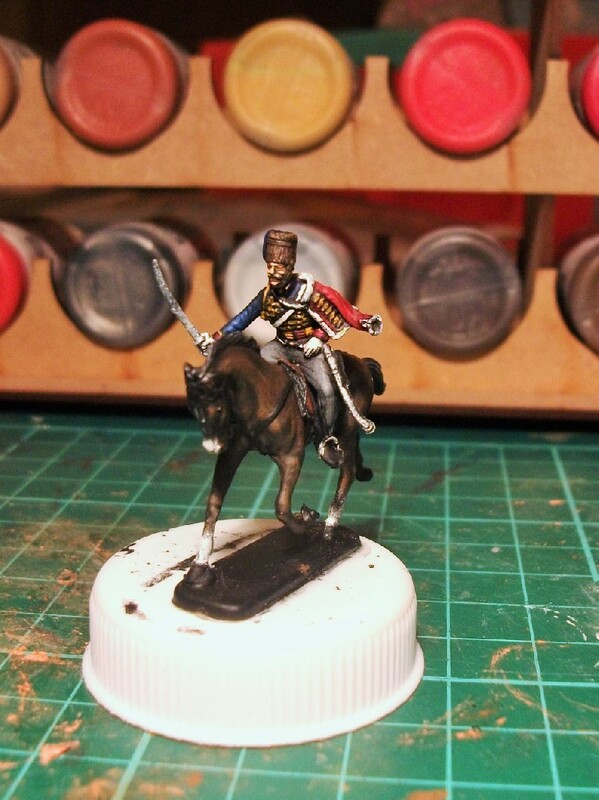 This past week I initially intended to take a break from painting for a few days after intensive development of my Prussian Leib Hussars. 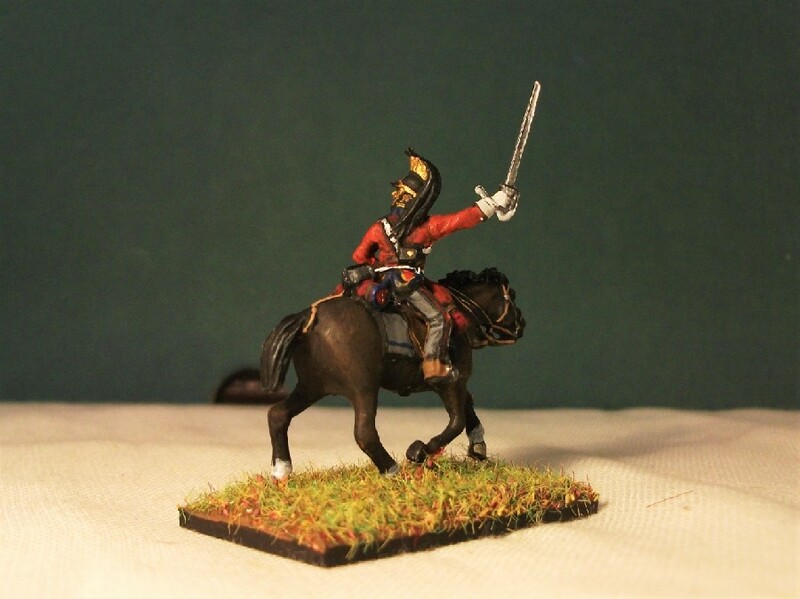 But… well, it didn’t take long before I got straight to work on my next regiment which I can announce will be the Dutch Red Lancers of the Imperial Guard. 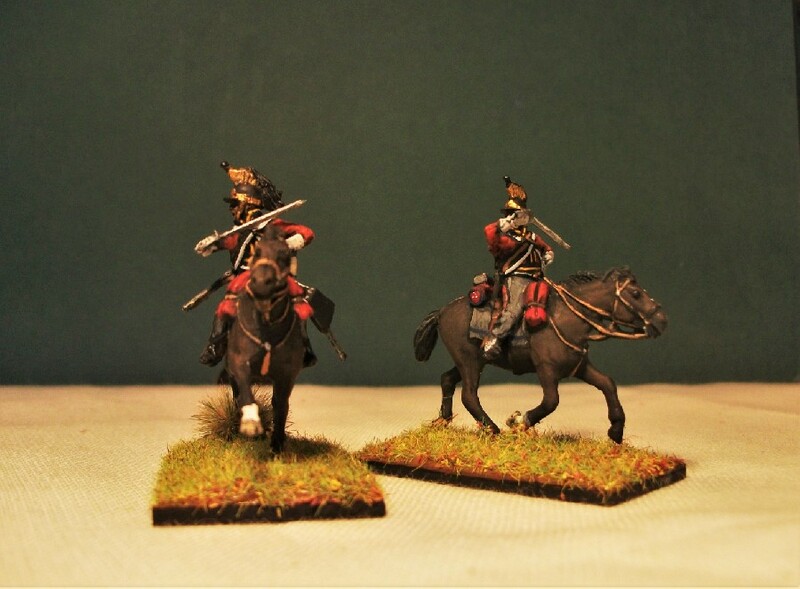 These impressive figures are by Russian manufacturer Zvezda. 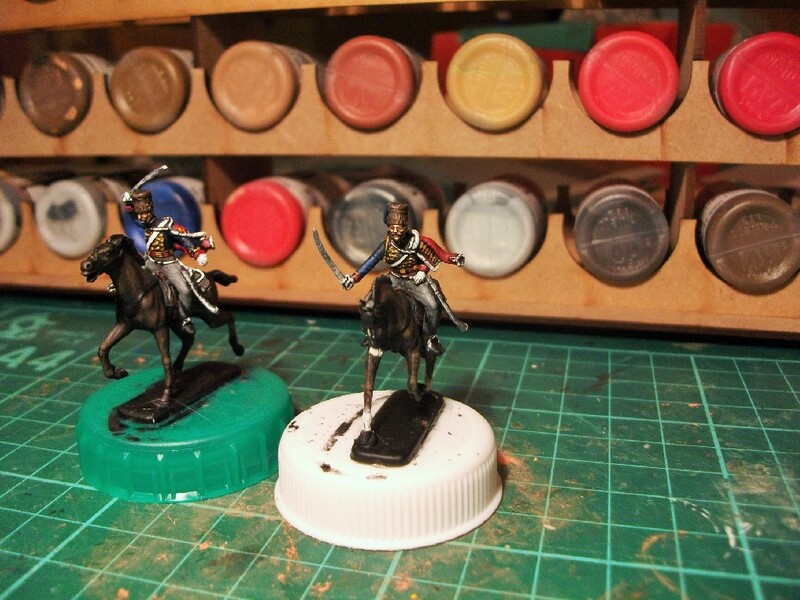 Despite having 5 boxes of various Zvezda figures in my possession, these are the first that I’ve actually painted. 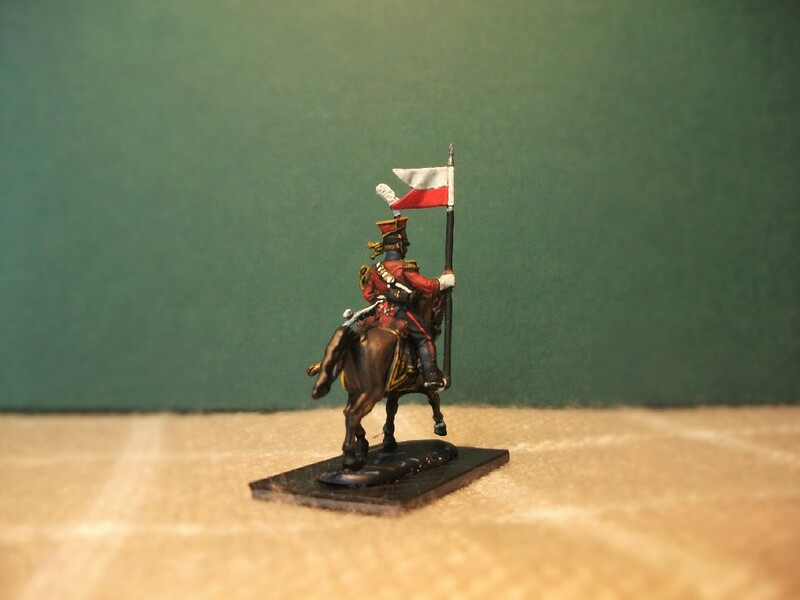 You can observe that these figures are curiously described on the box as being “Lifeguard Polish Uhlans”. 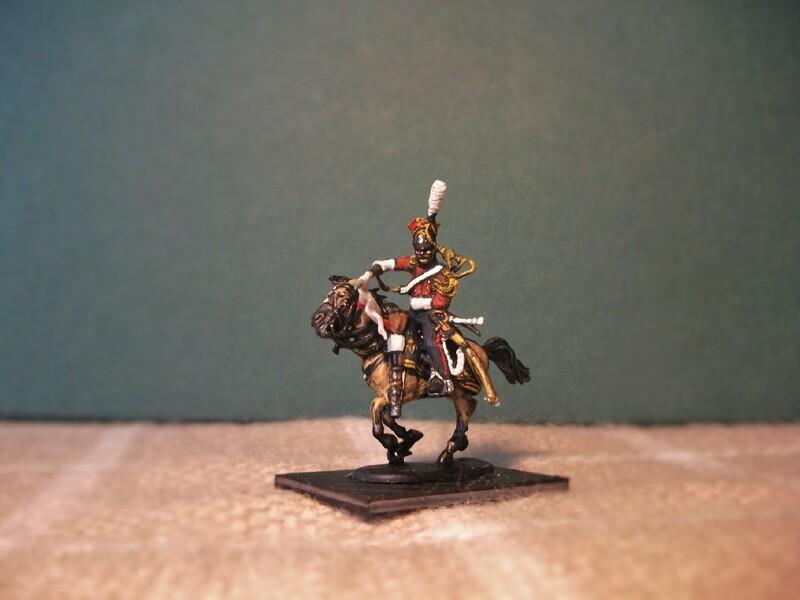 Uhlans is a German word usually applied therefore to Germanic lancers only, but this could simply be a translation issue. 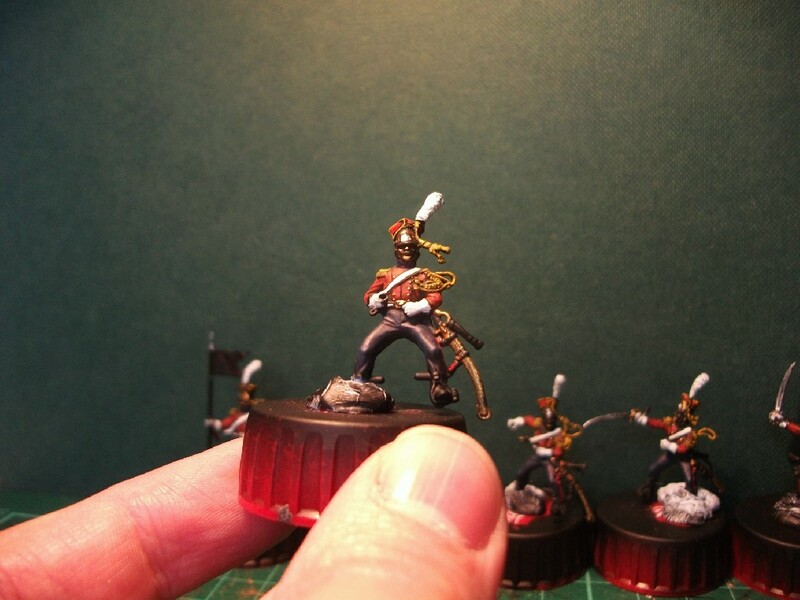 As for being “Lifeguards”, they have never been described as such, but were a part of Napoleon’s Imperial Guard. 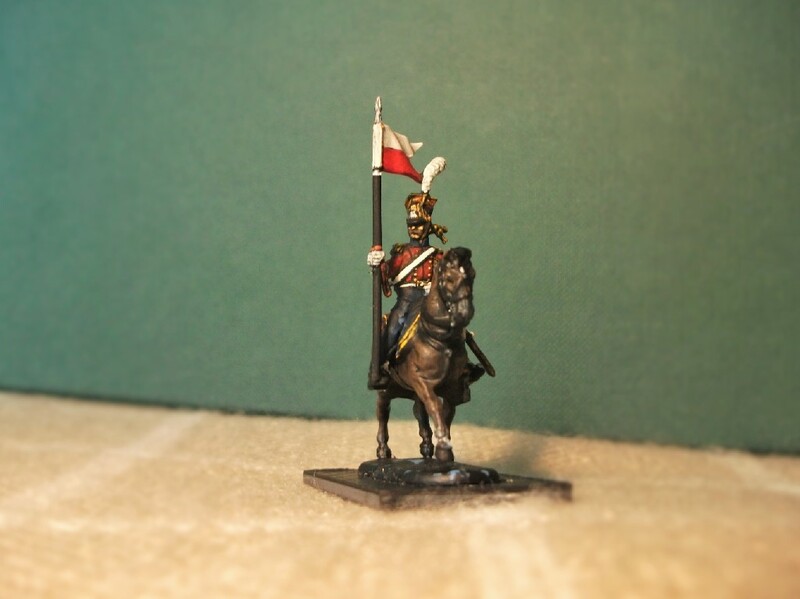 And I haven’t even painted them as “Polish Lancers” either! 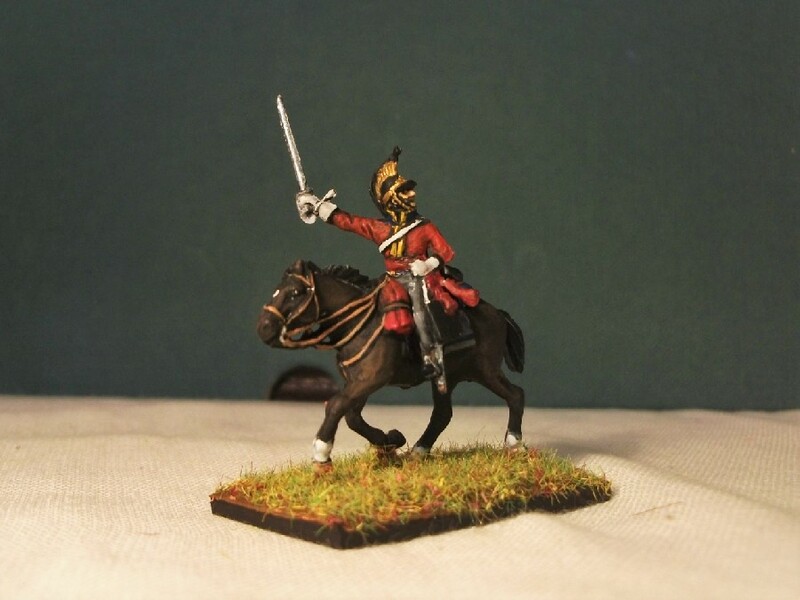 Instead, I’ve elected to paint them in the guise of their less famous sister regiment in the Guard; the Dutch Red Lancers. 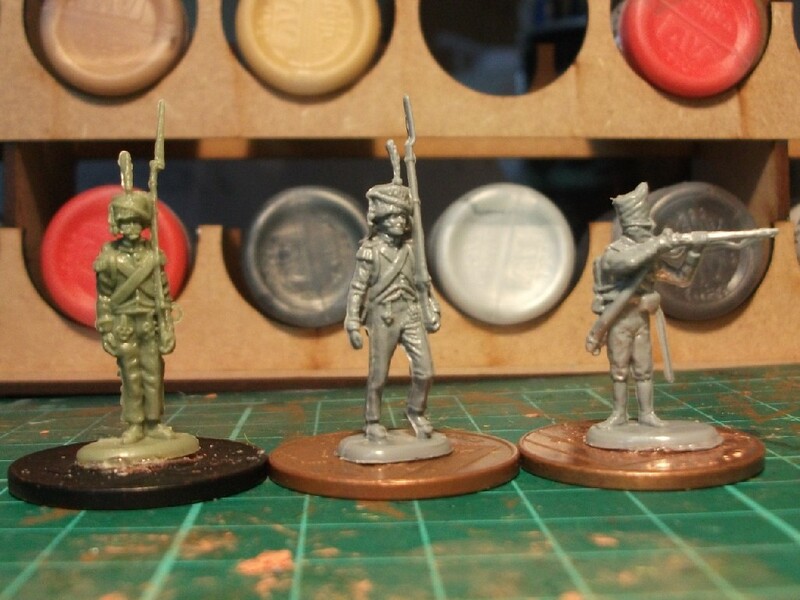 There will be a little more written about these figures and their historical namesakes in forthcoming posts, but in the meantime, here’s a glimpse of how they are proceeding at this early stage. 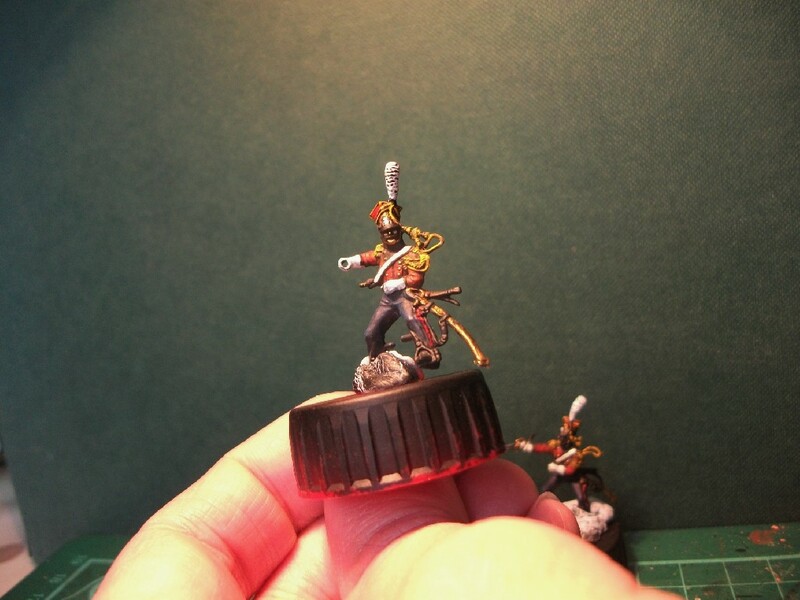 Still lots to do; painting, details, shading and highlighting, etc. 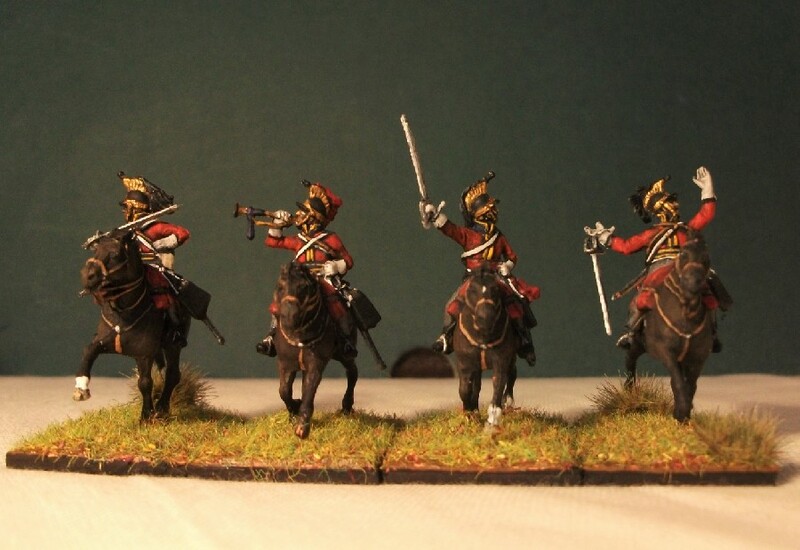 And some lancers can be seen currently without any lances. 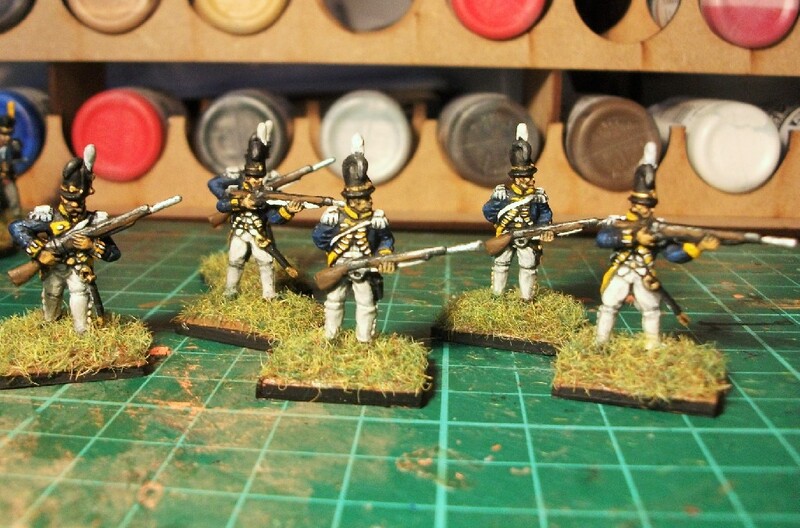 I mentioned in a previous post that I’d share some pics on my Napoleonic Swedish army project and, as good as my word, here they are! As stated before, I found the box when retrieving some Christmas decorations. 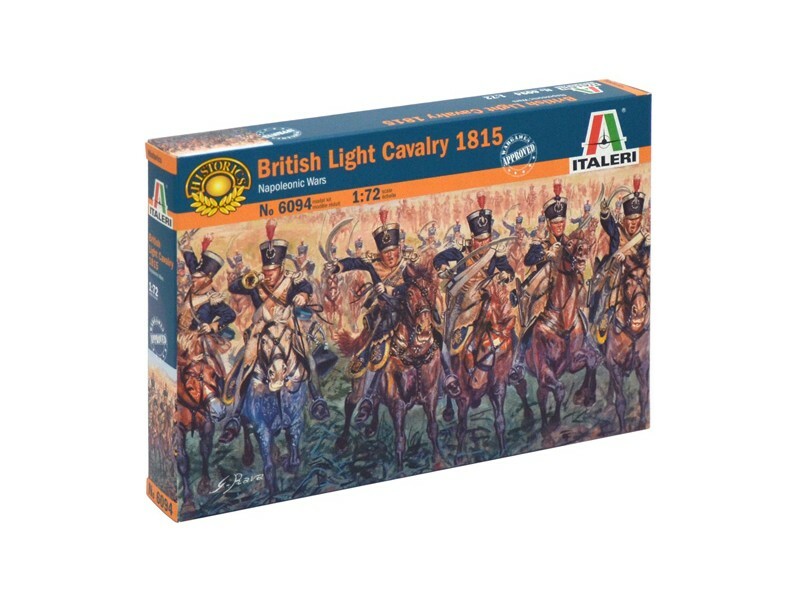 They were purchased for me (at my cheeky suggestion) by Mrs Lentonist as a 2013 Christmas present from a brilliant local model shop that was (tragically after 20 years) closing down and selling stock cheaply. 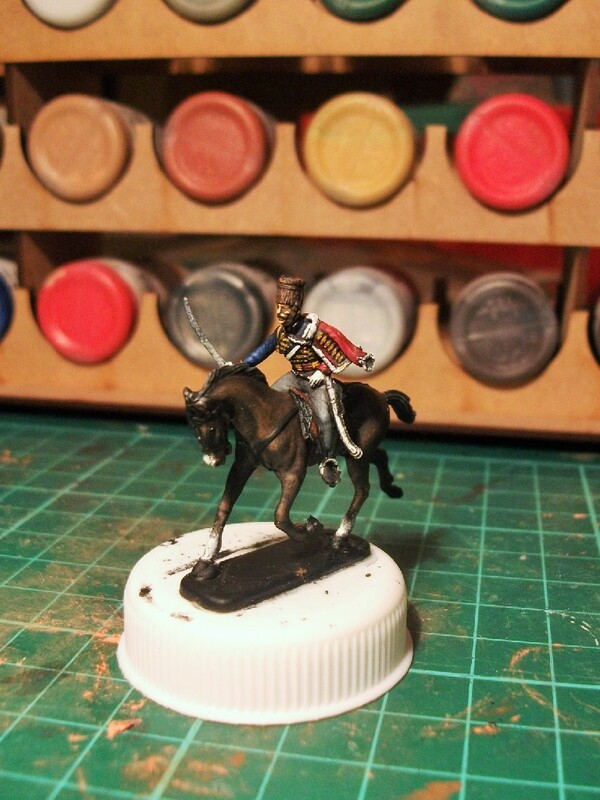 The sculpting certainly isn’t HaT’s best, but they are easy to paint and look good – I like to think – with paint on them. 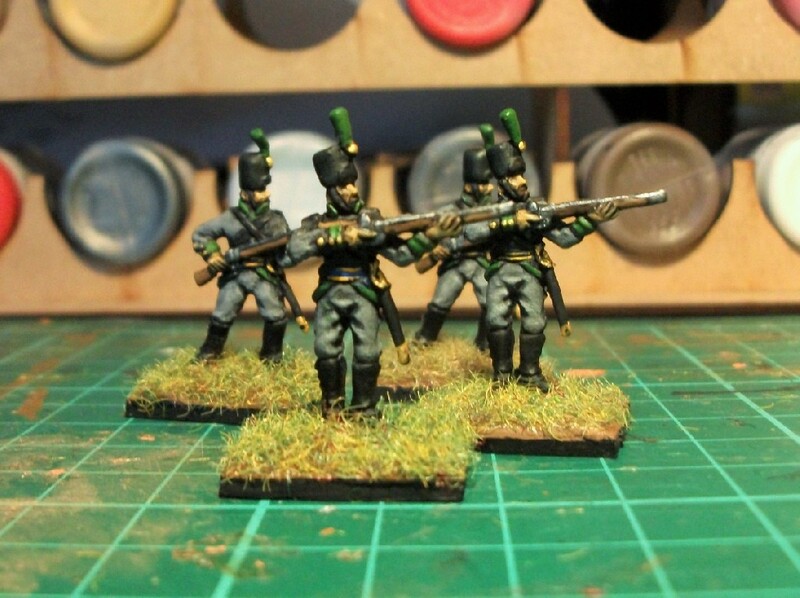 What I like about this issued from HaT are the range of types of infantry available; from guards, to infantry of the line, to jager. 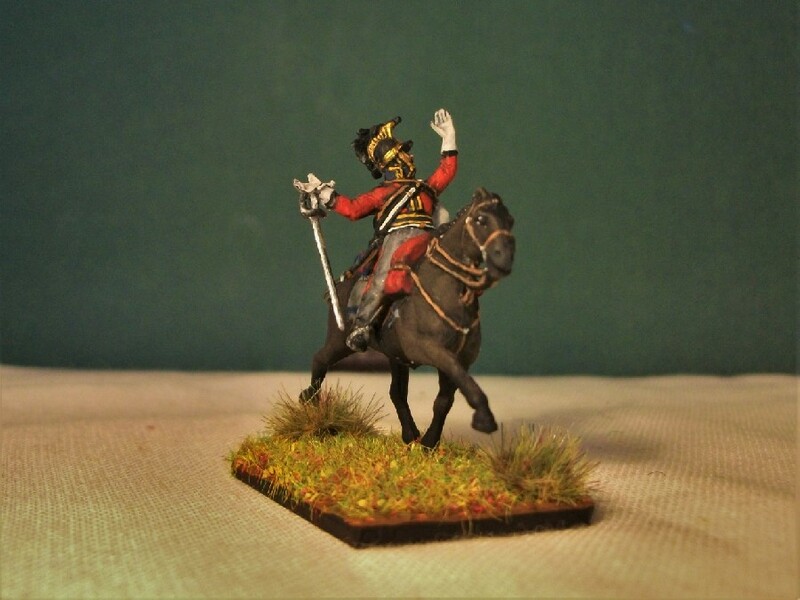 Furthermore the Swedes were an eccentric lot when it came to Napoleonic military fashion, a consequence of necessity (they were not a wealthy at the time and held on to old stock) and eccentricity (on the part of their then ruling monarch). 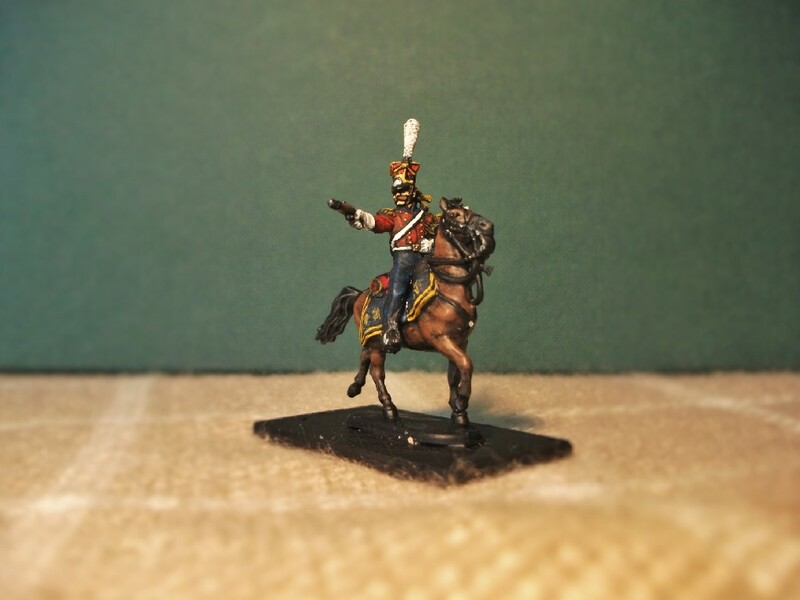 For a man that does painting for display and not for wargaming, the wide range in the box is a boon. 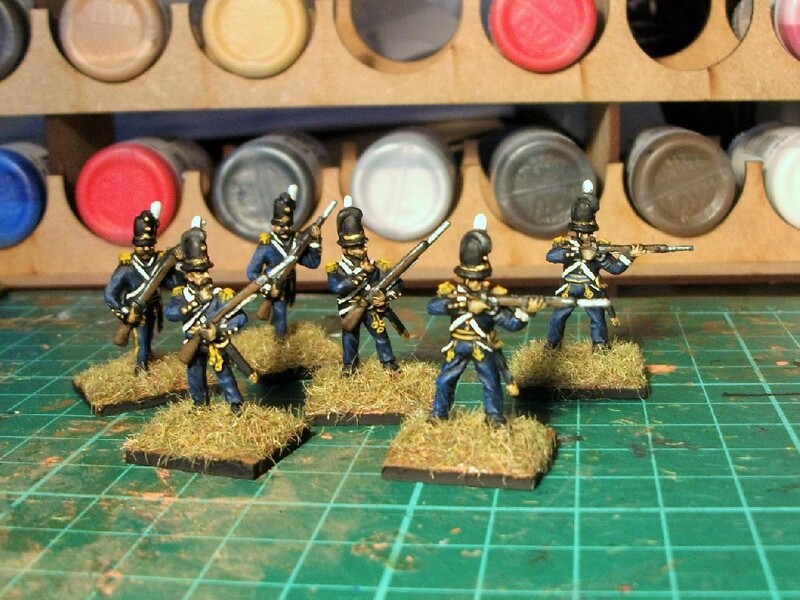 Often unfairly overlooked for their military involvement during the Napoleonic period, the Swedes were nonethelesss still active participants. 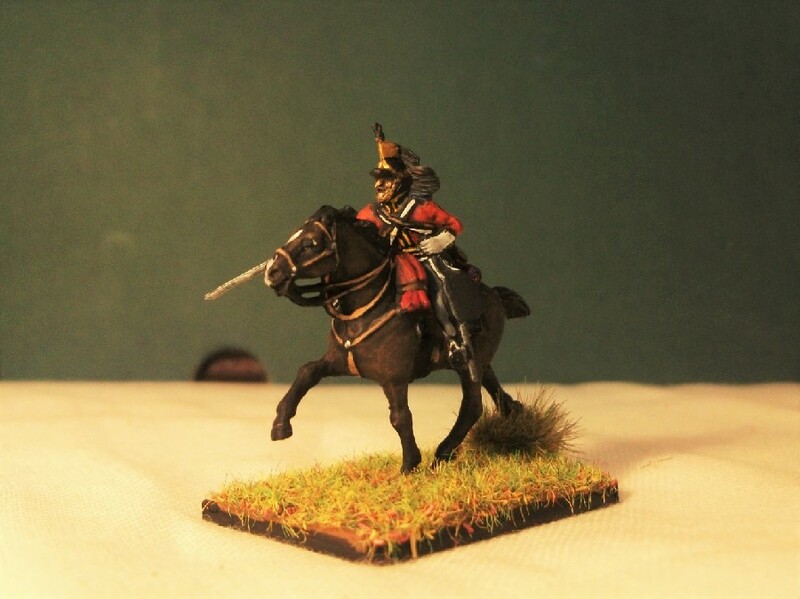 They faught the Russians, the Danes, the Norwegians and the French themselves during this era, most notably at Leipzig in 1813 under their new king Charles XIV, formerly known as one of Napoleon’s ex-marshalls; Bernadotte! 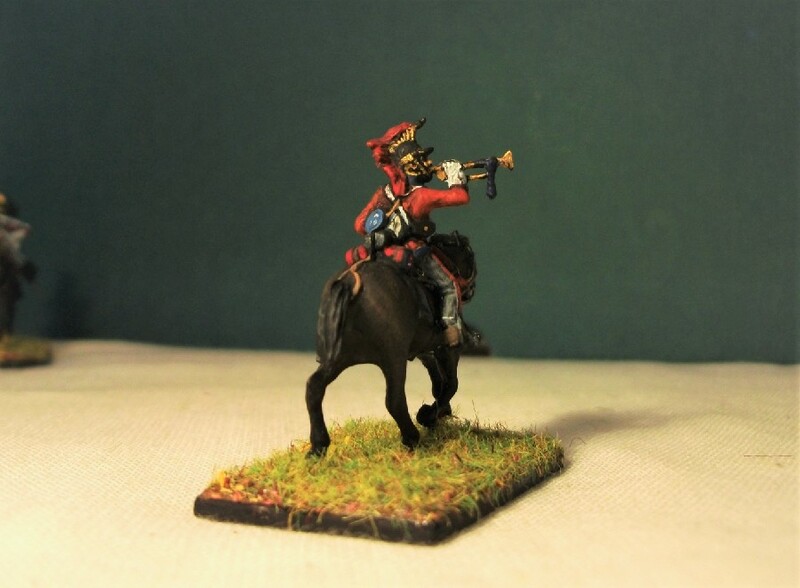 Bernadotte began a dynasty that remains on the Swedish throne even today and his military adventures with the Swedish army were to herald the end of warfare for his country; a nobly proud record that continues up to the present day. 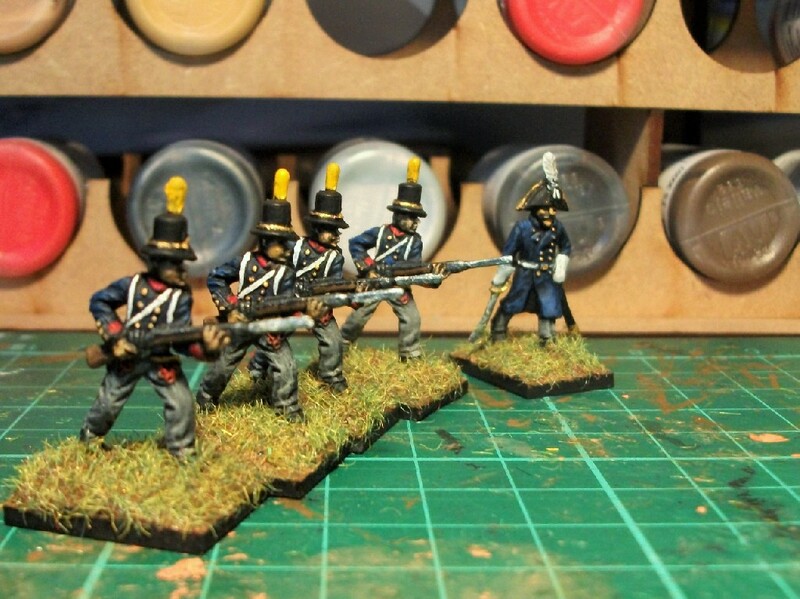 HaT Swedish Napoleonic Line Infantry with officer. 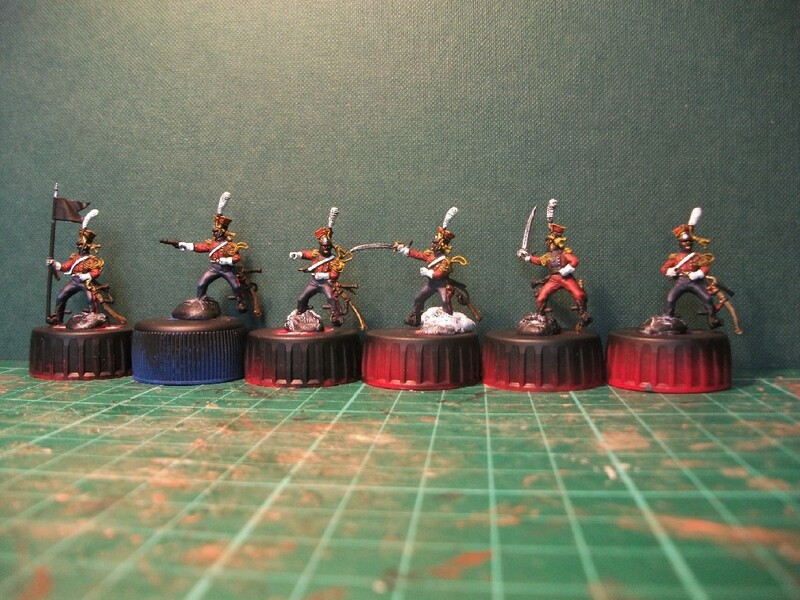 The Guard Grenadiers feature next. 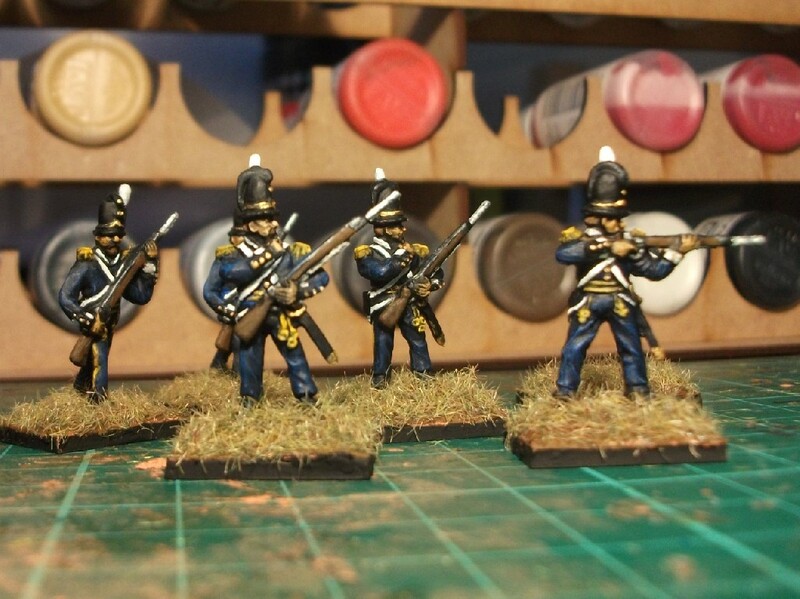 Note the perculiar crest coming over the tall helmet, a feature that moves about at various angles to the helmet in the Swedish army. 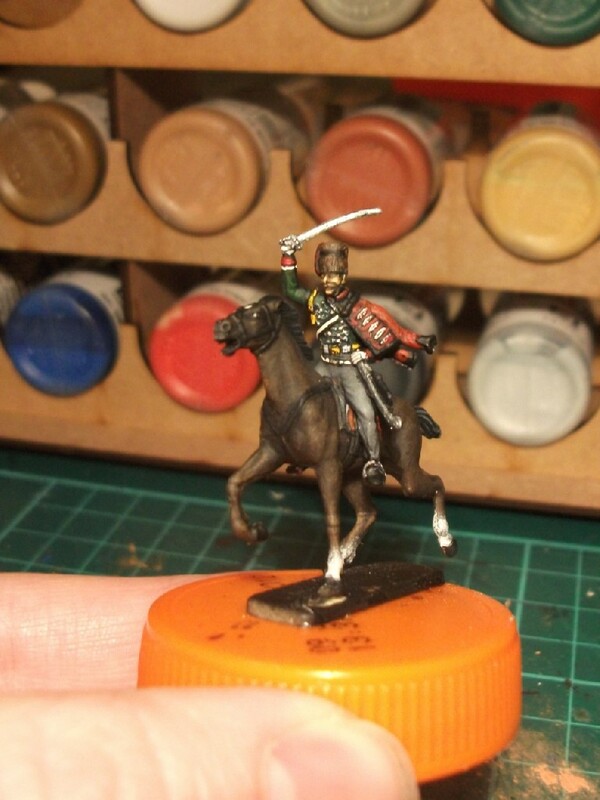 Next up, the Life Guard. There are only about 12 of these in total in the box. 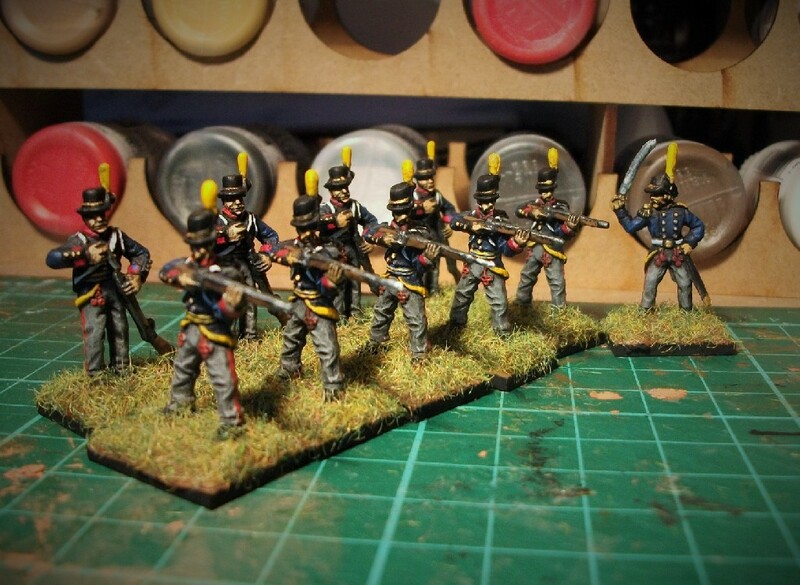 I’ve painted them with the ceremonial white gaitors rather than campaign black. 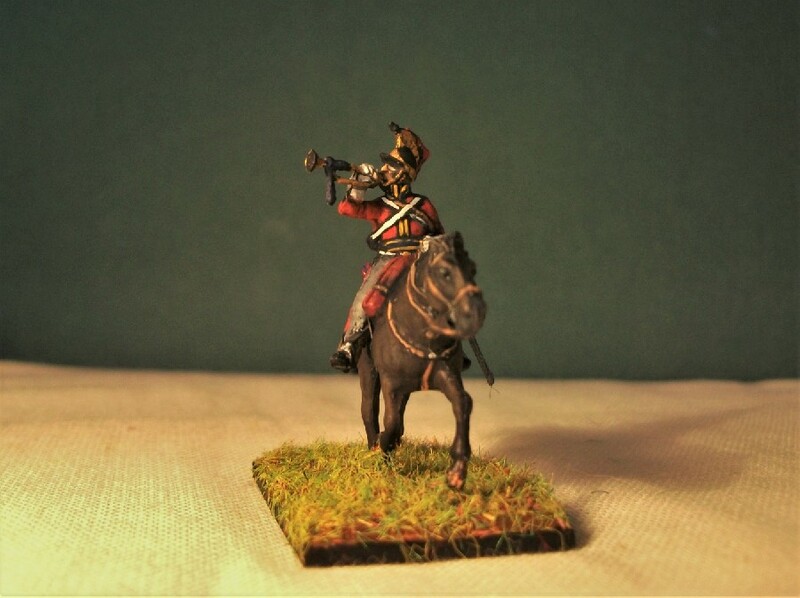 Note the curious crest that seems to feature at a 45 degree angle to the front rather than the straight-over versions of the Guard Grenadiers. 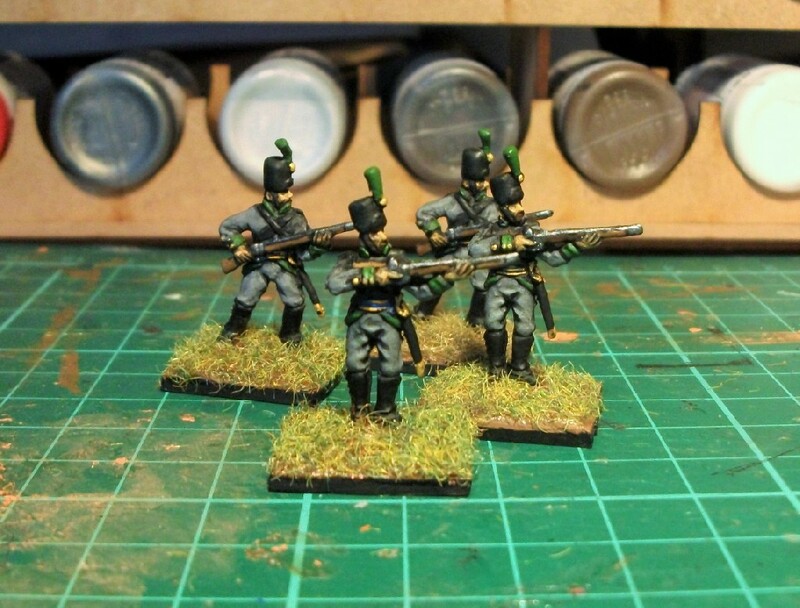 Finnish Sharpshooters from the HaT Swedish Napoleonic Infantry set. 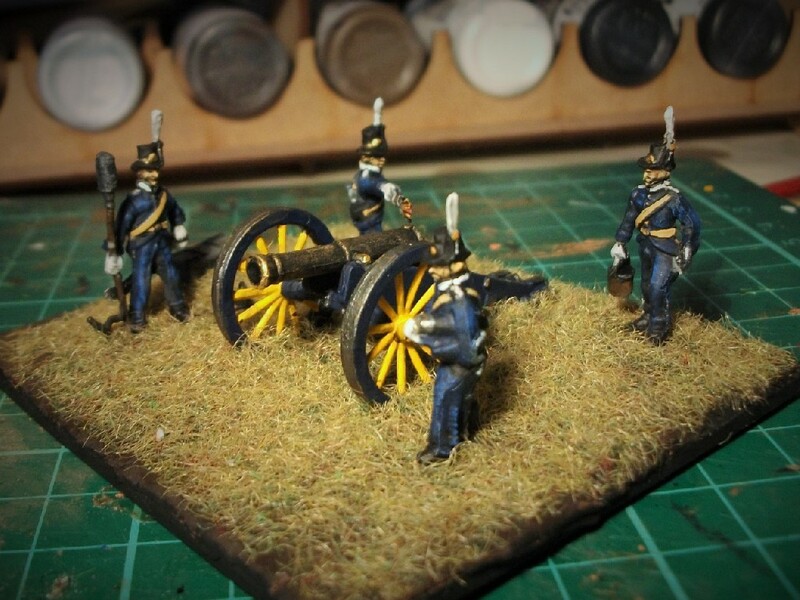 And finally, one of the two artillery units that I’ve made. 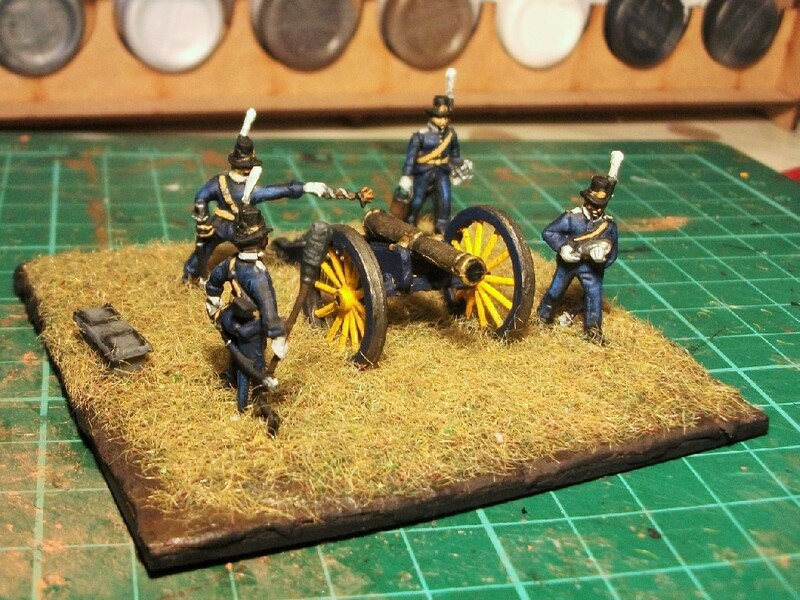 I’ll add a pic of the other howitzer unit as soon as I’ve added a finishing touch (i.e. a bucket!). 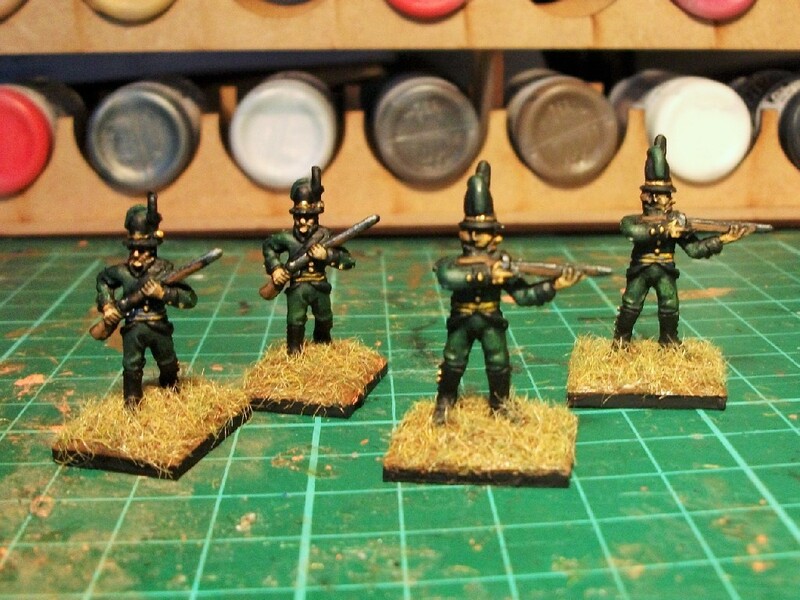 It’s a productive start to 2015 here at Suburban Militarism. My very best to everyone. 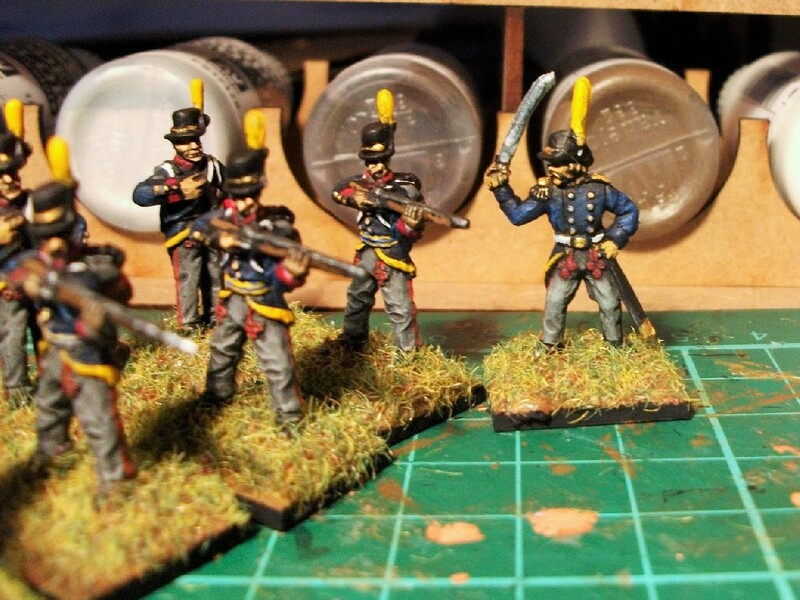 Well, I’ve put my name down to contribute a couple of figures that I knew I had lying around. 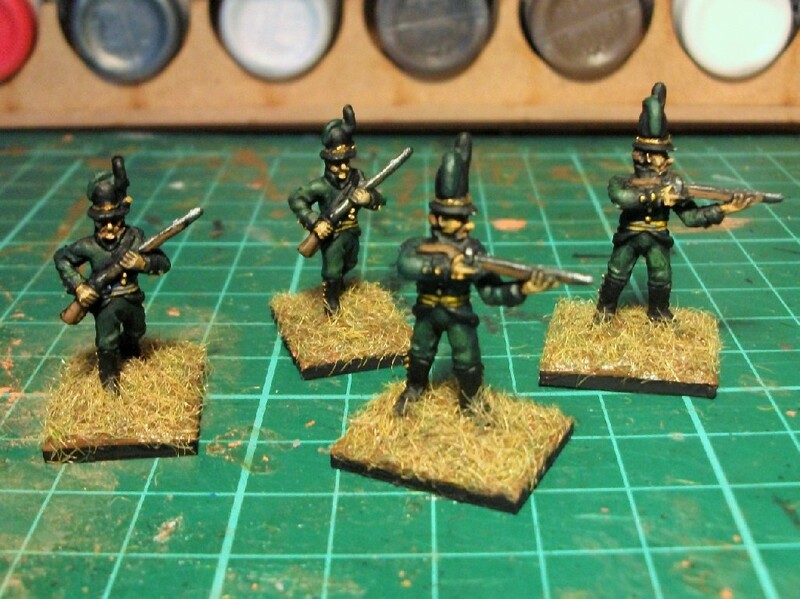 Specifically, HäT’s Nassau Grenadiers and Prussian Jager as shown below. My figures for the Benno’s Figures Forum group build project. 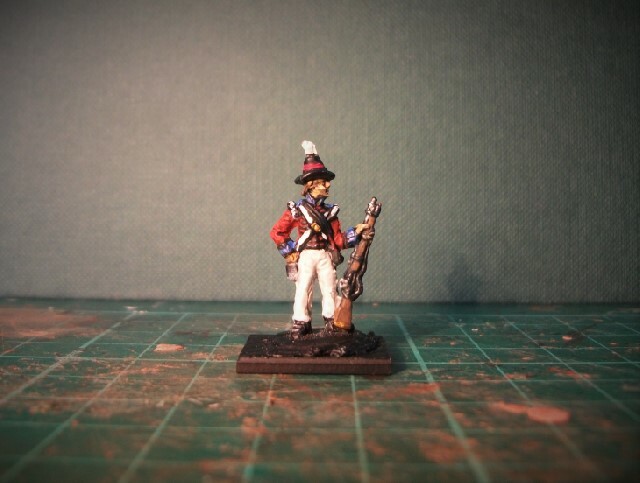 HaT Prussian Jager for the Benno’s Figures Forum group build project. 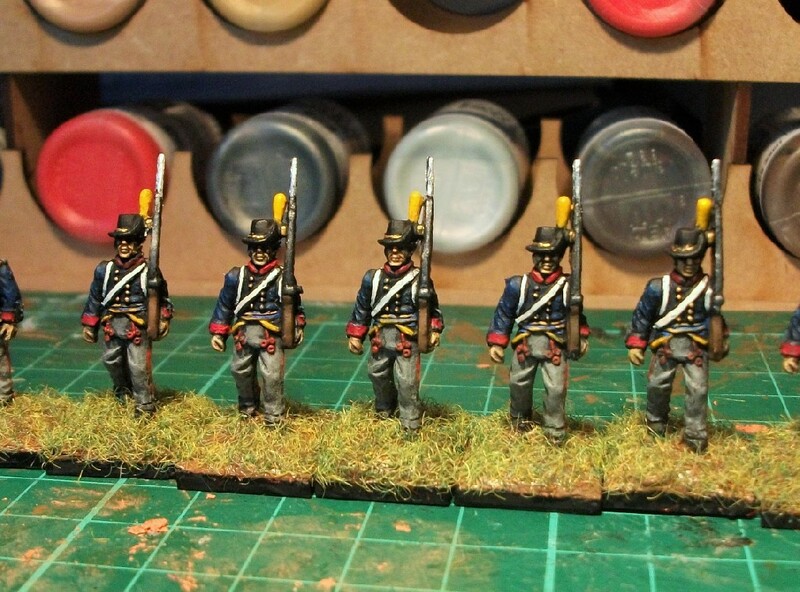 HaT Nassau Grenadiers for the Benno’s Figures Forum group build project. 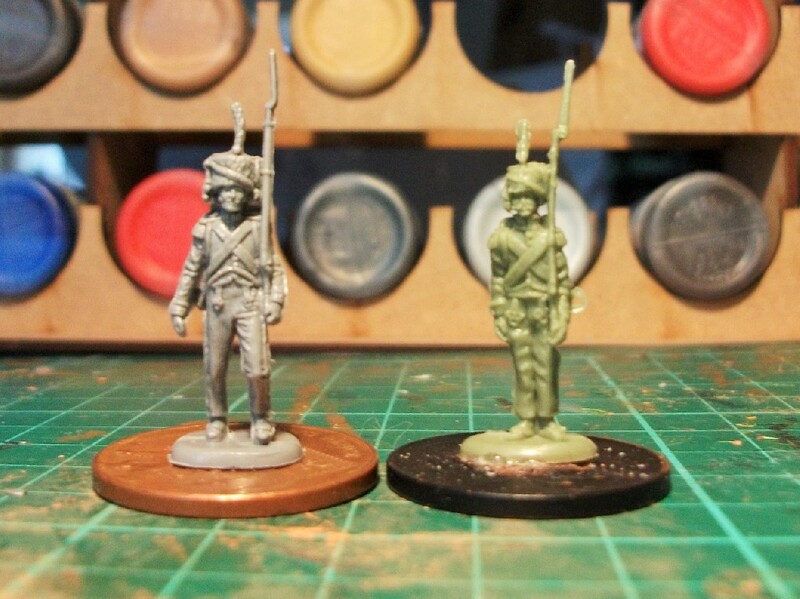 As you can see above there are two different types of Nassau Grenadier from separate releases. I’ll choose which one I like best soon but it will probably be the more dynamic grey-coloured version. 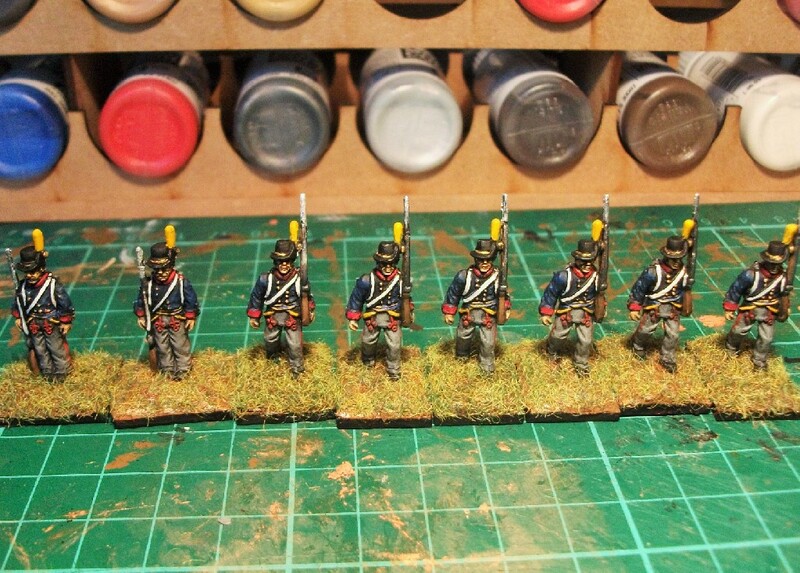 These, when complete, will be sent over to Germany to join the others painted for display at the FIGZ 2015 convention in Arnhem later this year. All of a sudden I feel a sense of responsibility! 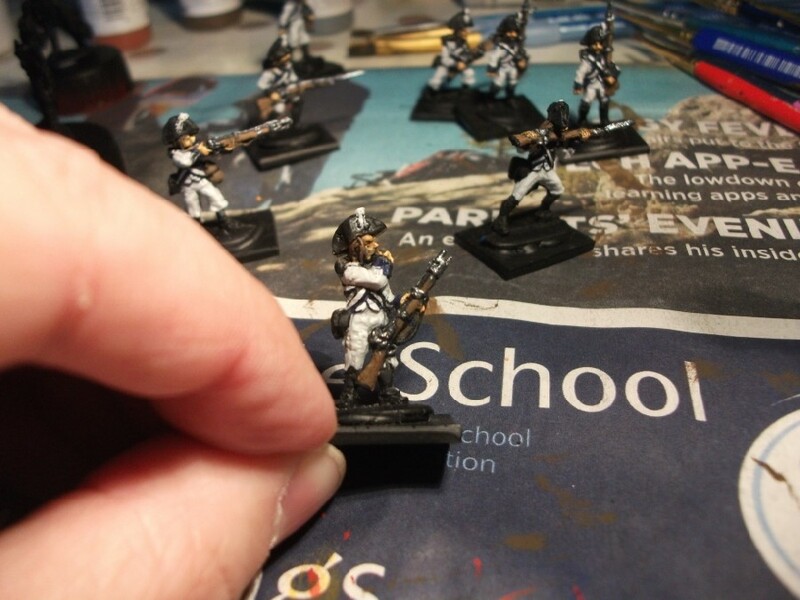 There’s no rush whatsoever as I’ve got until nearly April to paint just two figures but the pressure comes from Suburban Millitarism actually creating something for public display. The HaT ones probably wouldn’t have been the ones I’d have chosen to display my, ahh, talent, but I’ll do my best and keep the blog update with progress.